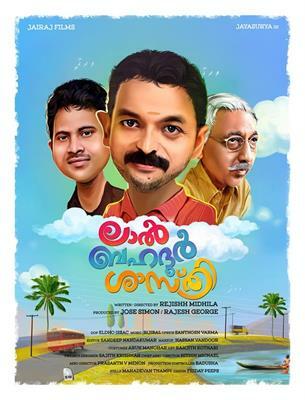 Lal Bahadur Shastri malayalam movie directed by debutant Rajishh Midhila featuring Jayasurya, Aju Varghese and Nedumudi Venu in lead will be creamed with humour to keep the audience intact. Much interestingly, Adwaith, son of Jayasurya would make his acting debut with this movie. Lal Bahadur Shastri revolves around the lives of three strangers, who later meet up to complete a mission in life. Jayasurya is blessed actor who has created his own space in the malayalam film industry through his hardwork and dedication. After a majestic year of success, the young actor will be a part of a handful of projects in 2014 itself. Jayasurya is doing the lead role in Rajishh Midhila's directorial debut 'Lal Bahadur Shastri' which will also have Aju Varghese and Nedumudi Venu donning prominent characters. Much interestingly, Adwaith, son of Jayasurya would make his acting debut with this movie. Adwaith Jayasurya,will be seen playing the childhood of Jayasurya's character onscreen. Even though it is not a full length character, the scenes are very much integral to the story of the movie. Bring a student of Class III, Adwaith is much interested towards editing and camera works. He has already done cinematography and even edited short films using FCP software. Adwaith has already made short films like Friendship and also acted in few others. Scripted and directed by Rajishh Midhila, Lal Bahadur Shastri revolves around the lives of three strangers, who later meet up to complete a mission in life. How they influence each other forms the crux of the movie. Jayasurya reprises the role of Lal, Nedumudi Venu and Aju Varghese portrays Bahadur and Shastri, respectively. Sandra Simon plays the role of a middle class woman who is a nurse. The movie creamed with humour is being made giving high consideration to the expectations and interest of the moviegoers. 'Lal Bahadur Shastri' is produced by Jose Simon and Rajesh George. For the lyrics of Santhosh Varma, the music is being set by Bijibal. Meanwhile, Jayasurya is having a good time with his career getting closely associated with a number of upcoming ventures. His character role on 'Appothicarry' has already got praise from online users. Jayasurya has already committed various projects including 'Aadu, Oru Bheekarajeeviyaanu' directed by Midhun Manuel Thomas, 'Mathayiyude Suviseshangal' and an untitled movie to be helmed by Priyadarshan. He would characterize the role of an auto driver in 'Mathayiyude Suviseshangal'. Valathuvasathe Kallan malayalam movie to be directed by Aashiq Abu featuring Prithviraj in lead. Valathuvasathe Kallan (Thief on the right side) is creamed with humour and will have new faces in prominent roles. Based on a short story written by Ambika Rani, the movie is scripted by John Paul while the screenplay is handled by Jayamohan. The music for the movie is composed by Issac Kottukapally. The movie will kick start by August –September 2014. Ammathottil new malayalam movie (2014) to be directed by Sreekumaran Thampi featuring Madhu and Sharadha in lead roles will start shooting in August. Produced by Roy John Mathew under the banner of Ragamalika Combines, the movie is blessed with the presence of Suraj Venjarammodu, Lalu Alex, Mammookoya, Indrans and Tara Varma. 'Ammathottil' tells the tale of a joint family. The director wishes to recreate the ambiance of joint family system and its enjoyment. Namasthe Bali malayalam movie to be directed by Bijoy will feature Roma Asarni and Aju Varghese in lead. Touted as a commercial entertainer creamed with humour, the movie will have elements of investigation. Being a female oriented theme, Roma Asrani was selected for the role. With ernakulam and Bali as the main location, 'Namasthe Bali' would kick start from 25th June. Enthoru Bhagyam malayalam movie directed by Sharath A Haridaasan featuring Unni Mukundan and Nikki Galrani will start rolling by the end of August 2014. Enthoru Bhagyam will be an intense love story creamed with humour. The movie will be shot in Kochi and Bangalore. Aamayum Muyalum malayalam movie to be directed by Priyadarshan featuring Jayasurya and Piya in lead would kick start by the first week of September. Innocent, Nedumudi Venu, Harisree Ashokan and Maniyanpillai Raju would also be a part of this project. Singer-composer M G Sreekumar would handle the music department. The movie is slated to release for this Christmas.